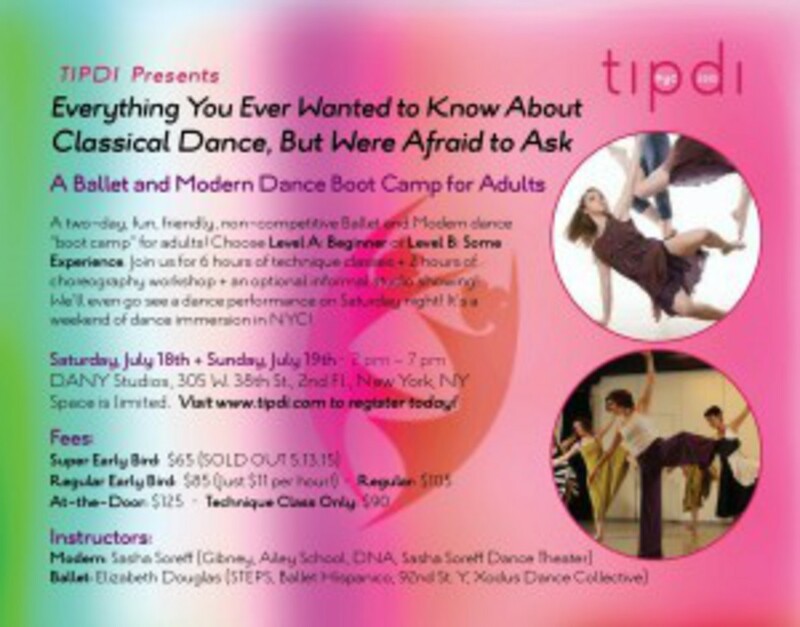 The International Partner Dance Intensive (TIPDI) is a series of weekend workshops for adult dancers and dance enthusiasts 18 and older. The program is held throughout the year in New York City. In 2015, our third year, we are offering a 2-day, 8-hour Ballet and Modern Dance "Boot Camp" for adults! Fun, friendly, non-competitive dance training with instructors from some of NYC's best dance schools, including the Ailey School and Steps on Broadway! Choose from 2 levels - "Beginner" and "Some Experience". Join us for two days of training that will improve your lines, power, flexibility, and musicality! 6 hours of technique class + 2 hours of choreography workshop + an optional open studio showing! We'll even go see a dance performance on Saturday night! It's a total dance immersion weekend! No scary, huge classes with a bunch of teenagers. TIPDI's "Boot Camp" is just for adults. Space is EXTREMELY limited. Early registration is recommended. Enroll today!